Adipose tissue deposition around the knee is a concern for many patients as it can make one’s legs look distorted and unbalanced. This can cause patients to feel self-conscious about the appearance of their legs, which may affect what they wear and what activities they choose to avoid; swimming for example. This article describes a successful treatment of adipose tissue deposited around knees using a sodium deoxycholate solution. Assessment of the treated area is essential for distinguishing whether the volume of unwanted soft tissue is a result of accumulation of fat or an issue with skin laxity. The latter would dictate further treatment options (mentioned below). A pinch test is a very simple and useful tool in this diagnosis; the pinched fold of the skin should be between 1.5-3cm thick and it should be difficult to roll the pinched skin between one’s fingers.1 The subcutaneous layer of fat is usually palpable and has a distinctive feel; if the folded skin can be rolled between fingers easily it usually means that there is very little fat underneath the dermis. For such patients, lipolysis will not be an appropriate option. 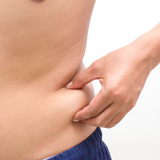 Patients with little to no subcutaneous fat should be offered alternative treatments, including radiofrequency (RF), high intensity focused ultrasound (HIFU) and, depending on skin laxity, they may also consider surgery. There are a range of energy-based devices that are used for body sculpting. Cryolipolysis is another popular approach to body sculpting, but in my experience and, due to specifics of the technique, it is very difficult to draw the tissue around the knee into the applicator. Surgical liposuction is another alternative. However, it is an invasive treatment and many patients (especially with those with small, stubborn fat pads) feel that surgery would be a step too far in addressing their concerns. Surgical treatments are usually more expensive, more time consuming, and might require considerable amount of downtime for the patients. As the fat cells are destroyed after injection with deoxycholate, patients who can maintain weight are expected to see long-lasting results.7 Once dissolved, fat cells are unlikely to redevelop; however, it should be noted that the remaining fat tissue can significantly increase in size when patients put on additional weight.8 For this reason, patients should be advised that maintaining a healthy diet is essential for ensuring long-lasting results of the treatment. A 23-year-old female patient presented in my clinic with concerns about the shape of her knees. She complained about large fat pockets on the inner side and above her knees, explaining that she felt that it made her legs look unbalanced and unattractive. So much so that she wouldn’t wear skirts or shorts and explained to me that the look of her knees caused her a great deal of discomfort. We discussed her concern in detail during the consultation and aside from her knees, the patient was otherwise happy with her body. Her body mass index (BMI) was within normal limits and she led a fit and healthy lifestyle. In this case, the pinch test showed that the skin fold was approximately 2-2.5cm thick and the fatty tissue was palpable during an attempted roll of the pinched skin. Treatment with sodium deoxycholate solution was therefore proposed to the patient. The product I use is called Aqualyx, which is CE marked in Europe and is indicated for the treatment of stubborn fat pads.6 It’s necessary to note that deoxycholate solution will not improve issues with skin laxity, so this was discussed with the patient to set realistic expectations. After performing the pinch test, the patient’s skin was marked while she was standing up, as this allows for appropriate assessment of the treatment area, easier identification of excessive fat and allows for more a more precise injection (Figure 1). After marking the treated area, I find it is worth discussing the approach and procedure again with the patient, just to ensure they know exactly what to expect. All of my patients are offered a cooling-off period after initial consultation and I always discuss possible side effects and expected downtime with them. When patients decide to progress with the treatment a consent form should be completed and photographic documentation obtained. An aseptic technique was used and four vials of sodium deoxycholate (two per each limb) were injected into the treated areas, directly into the subcutaneous fat. Each vial was mixed with 0.2ml of 2% lidocaine. 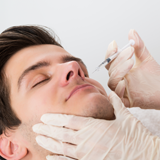 In my practice, I use 25 gauge cannulas in the chin and on larger body areas but prefer to use a 30 gauge needle in smaller areas, as in my experience it is more precise. With this being said, a 30 gauge needle was used for this particular treatment. It is very important to inject into adipose tissue within its boundaries and the cannula or needle introduced into fatty tissue cannot be visible or palpable, otherwise it will dissolve the thin layer of subcutaneous fat causing superficial indentations or it simply just won’t work. After injecting, which was within borders of adipose tissue, not too superficial, and ensuring even distribution of the product (to potentially reduce the risk of necrosis) a gentle massage of the treated area was performed as this is generally recommended to help evenly distribute the product. Post treatment, patients should be advised to avoid exposure to heat and sun for a minimum of two weeks and a balanced nutrition protocol is recommended by the manufacturer to achieve best results. A few days after treatment, regular exercise is also recommended.6 Additional injections may be performed no earlier than three months after the initial treatment and although there may be a visible improvement after the first treatment, most of the time a course of two or three visits, spaced at least three months apart, is required. In this case, the patient underwent only one treatment session and was satisfied with the final result. This patient reported that most noticeable swelling occurred within 24 hours and lasted for 96 hours’ post treatment. Initially, she felt some discomfort but said that it subsided over the first 48 hours. Haematomas disappeared within a week. The patient started to notice visible improvement approximately six weeks after treatment (Figure 2). Managing patients’ expectations is very important. If the patient has several areas of concern that relate to a weight issue, practitioners should suggest addressing the problem with a tailored weight loss programme, followed by cryolipolysis. However, it is important to note that this is not always necessary, like in this case for example. Remaining areas requiring improvement (small stubborn fat pads) whether on the abdomen, chin, flanks or knees (which are some of the most common areas) can be then treated with sodium deoxycholate. I believe deoxycholate is a very effective tool for minimally-invasive fat reduction. Proper selection of eligible patients and efficient management of their expectations are critical for achieving optimal results. Although not performed in this case study, combination treatments can also be considered, especially in the era of prevalent energy-based treatments. The treatment results can be expected to be very long lasting and the safety profile appears to be favourable.